To paraphrase James Carville, it’s the efficiency, stupid. TOKYO -- Fuel cells. If there are two words that seem most likely to prompt guffaws out of greentech executives, the devices that promise to extract electricity out of chemical reactions would probably be it. Honda, Toyota, Nissan, Daimler, Toyota and others continue to invest research funds into hydrogen fuel cell cars that they claim could come within the next decade. Skeptics abound. A host of manufacturers have proposed methanol fuel cells for portable electronics. PolyFuel, one of the more visible proponents of portable fuel cells, called it quits earlier this year. But in the right situation, fuel cells can be attractive, particularly when you can capture waste heat generated in the fuel cell reactions, according to Junji Yoshida with the strategic planning team with Osaka Gas in an interview in Tokyo. The system effectively works as a co-generation plant, the kind of thing that industrial manufacturers employ to keep energy costs down. Industrial co-generation has been popular for some time in Japan and is gaining rapidly in the U.S. For Osaka gas, fuel cells represent a way to compete against electric utilities. Here's how the math works. 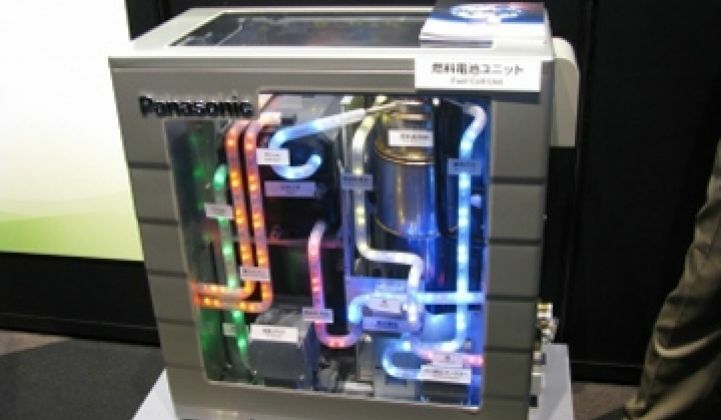 The home fuel cell promoted by Osaka and Panasonic is about 35 percent efficient when it comes to generating electric power, meaning that only 35 percent of the power put into them gets turned into electricity. But if you add in the waste heat, the fuel cell is approximately 80 percent efficient in converting the total energy put into the system into something useable. The grid is Japan is about 40 percent efficient in the country, he said, which makes it technically better than fuel cells at producing electricity. 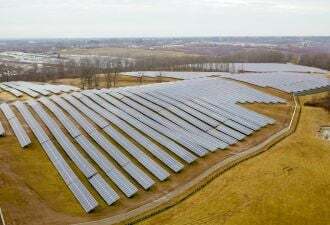 But 55 percent of the energy inserted into the grid gets lost as waste heat at the point where the power is generated and another four percent gets lost in transmission, he said. Since few people actually live near a power plant, the heat can't be captured and gets dissipated. Thus, fuel cells win out. Natural gas is more efficient than both. "There are no losses when natural gas gets delivered to the home," Yoshida said. Nonetheless, since most consumers have swapped their gas chandeliers for electric lights, it isn't practical to convert completely to natural gas. Unless you have a fuel cell. Trials on these devices have gone on for about five years. The fuel cell systems cost 3.2 million yen ($36,000) and buyers qualify a 1.4 million yen ($15,700) subsidy. The system puts out about a kilowatt of power and curbs carbon dioxide a bit, depending on where you live. If you are in a coal region, it can add up to more than a thousand kilograms. Carbon dioxide is released as part of the process. "You should get payback in five to seven years," Yoshida said.